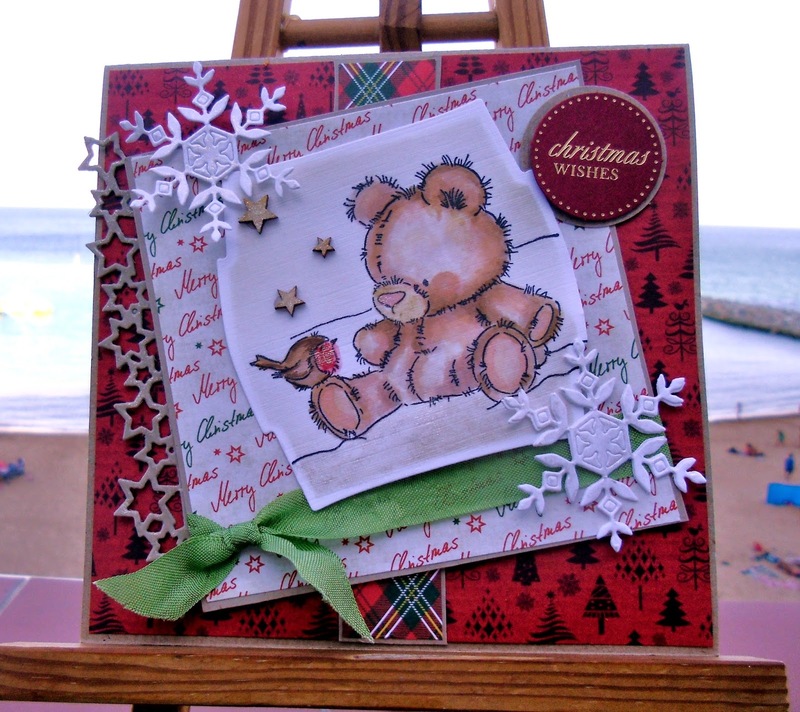 A lovely card Sylvie, love the background papers and the cute Teddy bear image. I cheated this time I'm afraid coz I didn't have a Christmas Teddy for the CCC group so used a polar bear instead, lol. So lovely that you got to spend some quality time with your granddaughter, Sylvie! And your card is super sweet - love how you used the pop of green ribbon too! Sounds like you had an amazing time with your granddaughter Sylvie! Lovely card; that bear and robin are so cute and love how you popped in those stars. Oh what an absolutely gorgeous and adorable card. What a gorgeous Teddy image and lovely backing papers. So festive looking. We are spending time with our grandchildren this weekend. It was our granddaughters 4th Birthday yesterday with a picnic in the park. No bears there though!! Hugs Mrs a.
Oh bless you Sylvie - this is adorable. Such a gorgeous image and a beautiful photograph to boot - nothing wrong with it at all. You sound as if you had a fab week with your granddaughter even if it was all GO! Gorgeous card Sylvie. I love the sweet image, beautiful papers and fabulous layout too. A gorgeous Christ,as card Sylvie. I love the cute image and fab layout. Sounds like you had a wonderful time with your grandaughter. Nothing beats time spent with family! Your card is adorable. Love your sweet teddy and the pretty card design. The MB star border is especially lovely!